Tonight, the Manchester branch of the Malmaison hotel chain hosted an insight into one of the worlds best-selling blended malts – Johnnie Walker. Hosted in their exclusive Ember bar, and by a gentleman ironically named Johnnie Walker, himself a former craftsmen cooper and now a Director of Wine and Spirits for Malmaison, the seven of us were sat in front of three offerings, Green, Gold and Blue Label. But before we were sampling the delights, Johnnie gave us an insight into the Johnnie Walker brand and how in 1805, the legacy began. Born in Kilmarnock, he purchased himself a grocery store at the age of 14 after his fathers passing and ran the business, selling everything from writing paper to his own whisky, until his death in 1857. His son Alexander took over and set about globalisation just a few years later, trademarking the name Johnnie Walker in 1877. In 1889, his sons Alexander II and George took over after his passing, and introduce the now iconic symbol of the Striding Man, created by the cartoonist Tom Browne, which adorns each bottle of Johnnie Walker and credited as one of the first global marketing icons. In 1909, the bottles were named after the colour that each were associated with, with the Red and Black Labels the first to be born, and each bottle was now housed in its distinctive square bottle as of 1920. From here, a Royal Connection followed in 1934, where still to this day they supply the royal household after receiving a Royal Warrant. So with a rather regal history, how does the Johnnie Walker range fair? The only vatted malt in the range (no grain, only 100% barley) and has a blend of only 4 single malts with the youngest being 15 years. Slight peat aromas on the nose mixing with citrus and orange to create a light offering. Smooth on the palate with just a whisper of peat that has a burst of mouth-watering flavour at the end, although it doesn’t stick around. 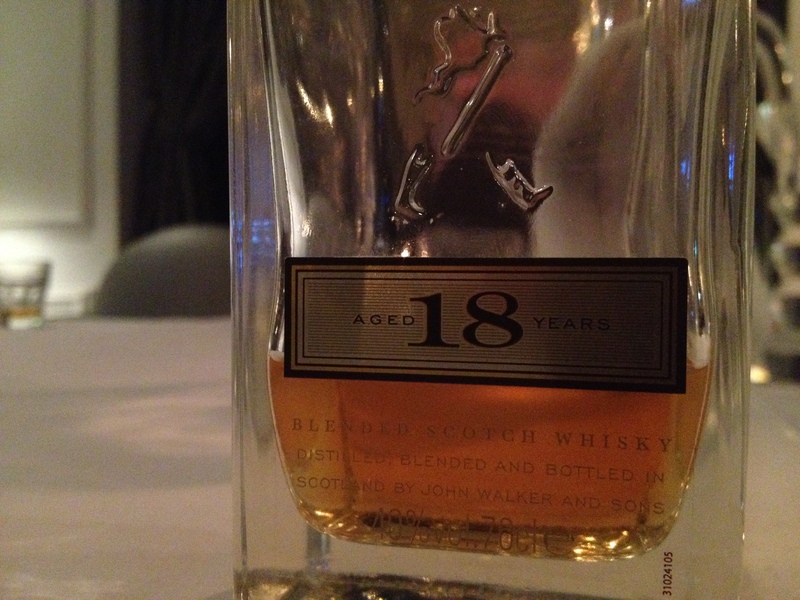 Blended from over 15 single malts, and created to commemorate Johnnie Walker’s centenary. A very light, smooth and sweet nose which carries on to the palate. Lots of honey and mixed cereal with a gentle smoke that creates a long after-taste. Specially blended to recreate the authentic character and taste of some of the earliest whisky blends created in the 19th century. A bold nose with dried fruits, spice and toasted corn aromas that turns to a rich, silky offering on the palate. A good kick-start of sweetness with vanilla and caramel that almost makes this verge itself to be a whisky liqueur. A long finish of cloves, spice and wood. Tonight was a fantastic insight into not only Johnnie Walker, but also whisky in general, with Mr Walker indulging in the production methods of single malt whisky, the regions and delights that each offers, as well as how blended malts came about. 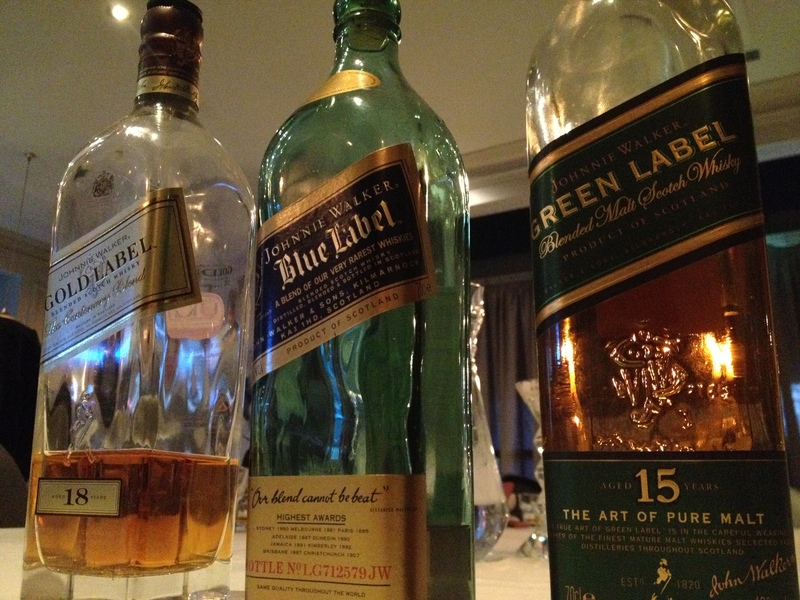 It’s great to try Johnnie Walker Blue Label again after first trying it at this years Diageo World Class Seminar, and at around £130, it’s not to be passed upon. A nose of light, soft heather, fruit and honey, creating a creamy palate with subtle flavours of fruitcake and wisps of smoke and oak. Short. The more familiar Black label will hopefully appear soon on my site to partially complete the collection under the Johnnie Walker family – I say that due to the fact their Johnnie Walker Blue Label King George V is around £350. Anyone with a spare dram? To check out more photos from the event, click here to be taken to my Facebook page.